Old and new come gloriously together! Welcome to Vineyards Antique Mall. 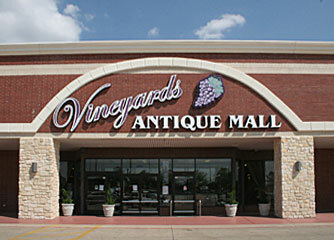 The search for the unique shopping experience leads to the Vineyards Antique Malls in Colleyville. At the Vineyards its all about you!!!! Old and new come gloriously together! Antiques, collectibles, primitives, art, lamps, sofas, chairs, beds, armoires…..
There’s something beautiful in every aisle. China, home décor, florals, rugs, tapestries… or select jewelry, clothing old and new vintage. The Vineyards features over 200 retailers- and best of all - enjoy fine dining in Coco's Tea Room and Bistro for lunch Monday - Saturday 11:00 am - 3:00 pm. High Tea available by appointment. Coco's also has a private meeting and party room for seating up to 60. Call 817-360-2625 for reservations. Visit us in Colleyville at 4701 Colleyville blvd - highway 26 between glade and brown trail. New dealers are always welcome – ask us about rental opportunities. The Vineyards Antique Mall – a shopping and dining experience that’s all about you!!! !